Can you beat six of the best tennis players to become the number one? 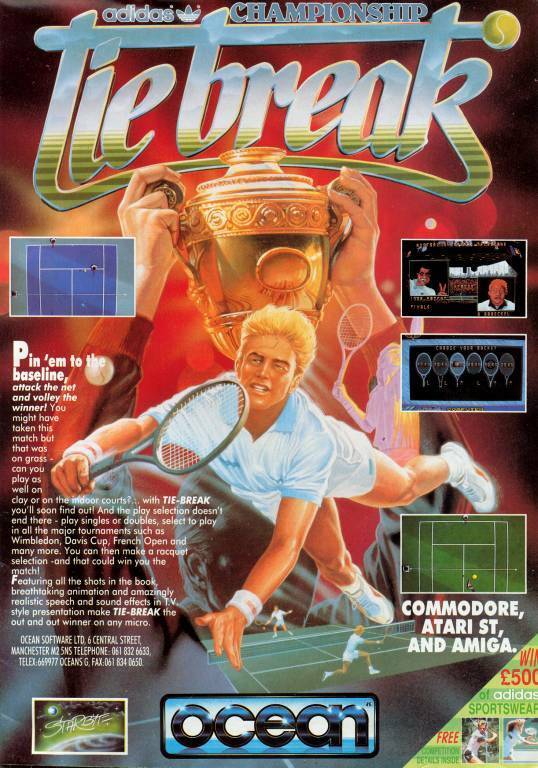 This tennis game is quite different from most others, in that instead of using a view from one end of the court, it uses a top-down perspective, with the screen scrolling as the ball moves from one side of the court to the other and back again. As well as being able to choose the length of a match, the type of court to play on, and whether to play singles or doubles, you can even select one of six racquets to use. Because you are unable to see your player all of the time, the game automatically places him in the correct position when the ball is returned to you, and both serving and returning the ball are very easy to perform. 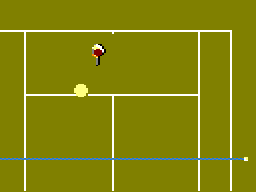 The graphics are a bit minimalist, and it may not be the most realistic simulation of tennis, but it's an easy game to learn and play. See also: Adidas Championship Football. Adiós a la Casta: Episode 1 is a platform game inspired by the 2015 Spanish elections. 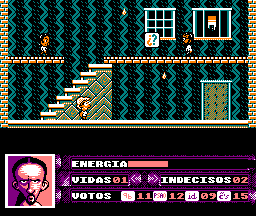 You play a character called Coleta Morada (a nickname of the Spanish politician Pablo Iglesias) who must collect as many opposition votes and the votes of undecided people as possible, with the votes being represented by icons. The more votes collected, the easier it will be for Coleta Morada to defeat the final boss Rodrigo Rata. To begin with, the game loads with a detailed screen. The intro music is good and a pleasant tune plays throughout the game. 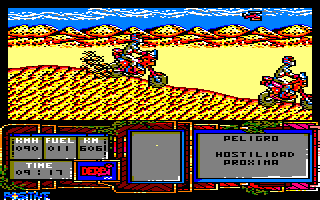 The graphics are displayed in MODE 1 with four colours, resulting in very detailed sprites and scenery. The sprites move very fast and smoothly; this game definitely requires fast reflexes! The game itself is of average length; it could be bigger, but it's not short at all. Overall, a very good platformer which might remind you of some NES platform games. See also: Adiós a la Casta: Episode 2: De Buen Rollo. Following the December 2015 election in Spain, no agreement could be reached to form a coalition, and new elections were held in 2016. 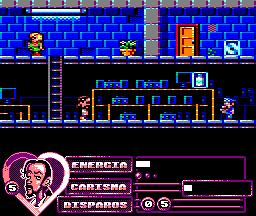 Once again you play Coleta Morada (known in real life as Pablo Iglesias), and you must wander around a supermarket and an underground car park, collecting objects to boost your own charisma and ammunition to help you defeat the end-of-game boss ANSAR. However, there are a variety of people and creatures who will drain your energy if you touch them. The gameplay is identical to the previous episode, but the graphics are drawn in the CPC's colourful, low-resolution MODE 0, and they look absolutely marvellous and are very nicely animated. A jolly and catchy tune also plays throughout the game. It's less difficult than its predecessor but it still offers a challenge. See also: Adiós a la Casta: Episode 1. Are pinball games really supposed to have a plot? This one does. A wizard has cast an evil spell over the land of Santagon and threatens to erupt a volcano. You have to make a potion and banish the wizard forever, as well as performing other tasks. These are done by extinguishing letters on the table and hitting other things with the ball. Why a pinball game needs a plot (especially one we've heard so often) is a mystery, but it's certainly not a bad example – just an average one. The ball moves rather slowly, but this doesn't make the game any easier, and there's also only one table. Set many years after the events of Colossal Adventure, the second in Level 9's Middle Earth trilogy has a simple mission – find and defeat Agaliarept, the Demon Lord, in his Dark Tower. Borrowing heavily from J. R. R. Tolkien, Adventure Quest has a number of familiar locations (starting outside the same brick building as in Colossal Adventure, for example). The descriptions are very well written, positively oozing atmosphere, and the parser is of a high standard for the time. Offering a definite challenge, Adventure Quest is not as accessible as its predecessor, but as with most Level 9 games, perseverance will bring reward. 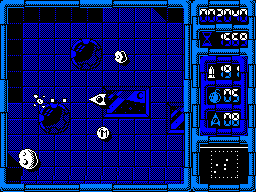 The re-release in 1986 as part of the Jewels of Darkness compilation features simple graphics which add to the experience, although there is something of a trade-off in game speed. A worthy follow-up to Colossal Adventure. 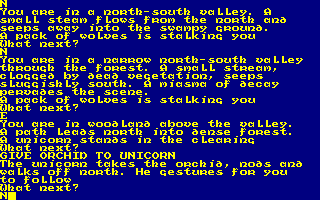 See also: Colossal Adventure, Dungeon Adventure. You're a wanted man in the Wild West, and have been forced out of the town of Santa Fe – but where are you going to go? This is a multiple choice adventure where you are given two or three options and then select one of them. 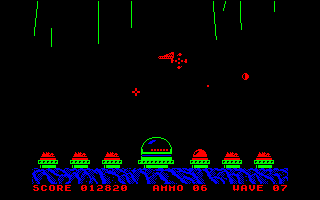 When you first see the truly luscious pictures (which were hand-drawn and then digitised and touched up on the CPC) and hear the music, you think that this is going to be a big game. If you play it for a while, though, you realise that there isn't as much as you think. There are very few locations, and while there are many opportunities to die, it's a very easy game to complete (there are two possible endings, by the way). It is worth playing just to see the gorgeous pictures, but should they have been sacrificed to make a bigger game? Take to the desert on your off-road bike as you negotiate all the stages of the African trail. Before you start each stage, you must select three items of equipment to take with you; the right choices may well be crucial. You have to gauge your speed correctly and perform wheelies where necessary when you ride over hills, or you'll fall off. You may also meet other riders who will knock you off your bike. Unfortunately, the gameplay doesn't match the excellent graphics – there's little scenery, the stages last too long, and there isn't enough of a challenge. Strap into an F-14 Tomcat and take to the skies engaging the might of the Soviet air force in this Cold War shoot-'em-up arcade conversion. Placed in a seemingly never-ending dogfight armed with only your trusty Mavericks and forward cannons, you pitch and yaw in 360° above a variety of landscapes, dodging enemy assault whilst mercilessly destroying them. 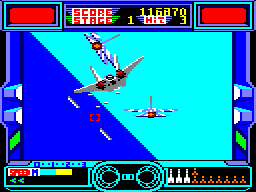 The graphics are superb, with large, colourful sprites all around, with appropriate sound effects that reflect your destructive capabilities adequately. This is such an accurate port that it suffers from the same drawbacks in gameplay in that destroying enemy vessels is a formality and it's random pot luck as to whether you are shot down or not. 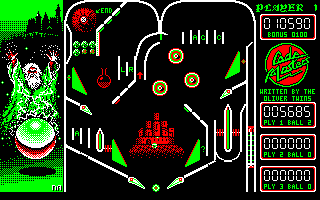 This is a version of the arcade classic Missile Command, where meteorites hurl down from space and obliterate your bases on the ground. You've got six bases, and an ammunition base to fire at the incoming meteors. If all of your bases are destroyed, that's it – the world is doomed! However, if any missiles hit your ammunition base, you won't be able to fire for the rest of the level. This isn't a bad game by any means, but it does become repetitive, and very easy when you only have one base left. The graphics are a bit dull as well. Take one of the earliest computer games ever (namely Asteroids), and add some nice graphics to it, along with a few bonuses to pick up. That's what you've got here. You control a little spaceship that floats around a large arena, and you have to blast all the meteors and other objects that bounce about the arena. However, shooting meteors will cause them to fragment into several smaller meteors. Another problem is that there's no friction and controlling your spaceship is difficult, to say the least. First impressions are good – you've got ten lives, and the first level is easy enough – but it doesn't last, as the second level is far too hard.